Ready to swing this weekend? 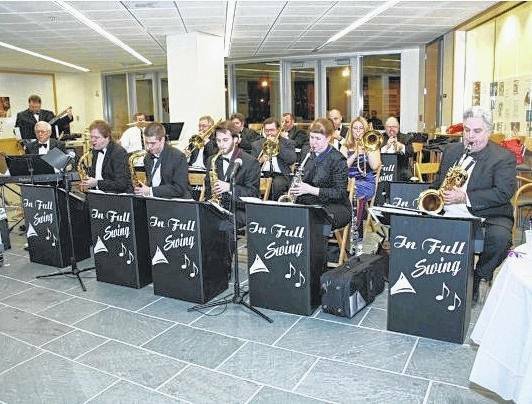 Hot music lineup in Delaware Co.
Columbus-based big band In Full Swing will perform Thursday during the next installment of the Preservation Parks Concerts in the Park series. Showtime is 7 p.m. at Gallant Woods Park, located at 2151 Buttermilk Hill Road in Delaware. Plenty of chances to enjoy a wide variety of music are available this weekend in Delaware County. The Preservation Parks Concerts in the Park series returns Thursday. Big band In Full Swing hits the stage at 7 p.m. at Gallant Woods Park, located at 2151 Buttermilk Hill Road in Delaware. The group has played numerous events, including the Gahanna Creekside Jazz and Blues Festival, Worthington on the Green, Westerville Summer concert series, Westerville Fourth Fridays Celebration, Delaware Bicentennial Presidential Ball, Grove City Summer Sizzle, A Taste of Worthington, and St. Michael’s Festival. Admission is free. Organizers encourage folks to take a lawn chair or a blanket. Refreshments will be available. No alcohol is allowed. For information, contact Preservation Parks at 740-524-8600 or visit preservationparks.com. The Reaganomics is the featured band as the Polaris Live Concert Series continues on Thursday at the Polaris Lifestyle Center. Showtime is 6:30 p.m. The lifestyle center is located at 1500 Polaris Parkway. Founded in 1996, the five-man band from Columbus has performed more than 1,500 shows. Admission is free. Attendees are encouraged to take lawn chairs and blankets. No sporting equipment, coolers, alcoholic beverages, picnic tables, balloons, pets, or smoking is permitted. The Columbus Zoo and Aquarium will play host to alternative rockers The Wallflowers and Better Than Ezra on Thursday evening. Doors open at 6 p.m. and concert begins at 8 p.m. at the Water’s Edge Events Park. The Village Pavilion in Shawnee Hills will once again be the site of Music in the Village on Friday evening. Central Ohio native Delyn Christian will perform beginning at 6:30 p.m. The former Columbus area radio DJ now makes his home in Woodbury, Tennessee. Admission is free. The Village Pavilion is located on West Cherokee Street Drive behind the police station in Shawnee Hills. Westerville’s Jazz at the Amp concert series swings back into action on Saturday. This week’s featured musicians are Deon “Saxman” Yates and trumpeter Cindy Bradley. Yates takes the stage at 6:30 p.m. followed by Bradley at 7:15 p.m.
Yates, a Detroit native, is not only a musician, but also an educator and two-time Emmy Award nominee. He’s worked with rhythm and blues greats like Nick Colione, Brian Simpson, and The Temptations over the course of his career. Since her debut in 2009, New York City-based Bradley has played everywhere from the River Raisin’ Jazz Festival in Monroe, Michigan to the Dubai Jazz Fest. She’s released four albums during her career. Admission is free. The Westerville Amphitheater is located at Alum Creek Park, 221 W. Main St.
Wrapping up the weekend is the next installment of the Harmony in the Park series. The Olentangy Men’s Chorus is scheduled to perform at 7 p.m. on Sunday at Bicentennial Park in Delaware. In case of rain, the show will be moved to the Delaware Community Center YMCA at 1121 S. Houk Road. Those attending are encouraged to take lawn chairs since seating is limited.